It is what we all want, and we all can achieve and is the reason I wrote the book. Anxiety robs us of so much; my dream through my suffering was just to have my life back, a life that I took for granted before I suffered. My personal experience of recovery still feels like a miracle after the depths I sunk to. It felt so far away that I never thought I would see the day when I could finally say I no longer suffer. It felt so far away because I was never given any answers to the way I felt or why I stayed in the cycle. As soon as I found these answers for myself, things started to make sense, and I knew, I could, at last, begin to move forward. I wrote this book on for everyone out there who still struggle for answers on their condition. 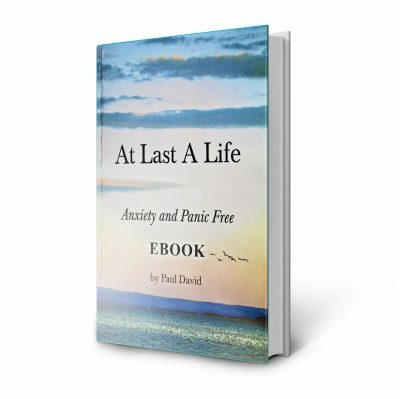 After my recovery, I went on to study the whole subject of anxiety and panic in full. I was not content with just recovering myself; I also wanted to dedicate my life to helping others. This was precisely why I wrote the book and put the site together, to reach out to as many people as possible. I have no interest in becoming rich out of other people’s suffering and selling them the newest miracle cure, online course or C.D set. I spent more money than I care to remember through my own darkest days, and it pains me to still see some of the false claims that are about on the internet. Too many people fall into the cycle of anxiety because the right help and advice are not available to them at an earlier stage. I firmly believe that doctors and specialists are not given enough support and guidance to understand this condition fully and if I had one wish, it would be that more information on this debilitating condition was made available to them. This in itself could save so many years of needless suffering. One of my main aims in writing this book was to make it as easy as possible to read and understand; to get my message across from a sufferer’s point of view and dilute all the jargon that you may have come across in the past. I also felt that I had more to say than had been churned out before, mainly by people who had never actually been through it. Every common symptom is explained in the book, not just the anxiety, but also, the feelings of unreality, the racing thoughts, feelings of dread, lack of confidence, depression, the constant worry cycle and many more symptoms that I have come across over the years. I also receive emails on a regular basis from people who say “Paul it all makes sense now, you are the first person to not only help me but actually tell me why I feel like I do”. The book continues to get tremendous feedback and has sold so many copies through recommendations. It is now on prescription through certain doctors surgeries and many people also tell me that their counsellor or therapist has put them on to it and that is something I am very honoured to hear. The book is sold all over the world and has been recently published in Japan, all this without any advertising or promotion. So many people email to say it is by far the best thing they have ever picked up relating to the subject, the only thing that truly helped. Chapter 2: What Are These Feelings I Feel? You can purchase the book in physical or e-book form with any debit, credit card or PayPal account, using a secure online payment by clicking on the book image below. The other two options are here on eBay or Amazon, including in Kindle form, this also gives you the chance to see the excellent feedback the book has received. The book is also now available as an Audiobook via download or C.D set from this website only. If you have any problems at all with your purchase, then please don’t hesitate to contact me.